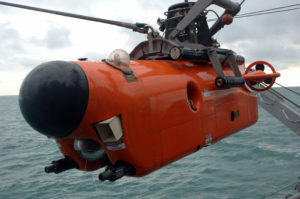 The mine neutralization vehicle (MNV) is a type of unmanned underwater vehicle (UUV) used by Navy mine countermeasure (MCM) ships to locate and destroy underwater moored and bottom mines. Development of the MNV began in the mid-1970s by the Naval Ocean Systems Center (NOSC) in San Diego. NOSC designed the initial prototype, two advanced development models, and a final testing model over a 10-year period before production began in 1985. Honeywell built the first MNVs until the early 1990s, when its spin-off company Alliant Techsystems took over production. In the early 1980s, the U.S. Navy began development of a new mine counter-measure force, which included two new classes of ships — Avenger-class MCM ships and Osprey-class coastal mine hunters (MHCs). MNVs entered service in 1987, the same year the first of these ships was commissioned, and they were placed aboard the MCMs and MHCs. Outfitted with high-resolution sonar, low-light level television, Mark 26 cable cutters, and Mk 57 mine destruction charges, MNVs were deployed from MCM surface vessels to detect, locate, classify, and neutralize moored and bottom mines. MNVs are tethered vehicles operated through control systems situated aboard the parent MCM ships. Initial detection of a mine (target) and MNV guidance is performed by the parent ship’s sonar. Initial MNV navigation is plotted and monitored within the MNV acoustic tracking system. The MNV’s high-definition sonar is used during the mid-course search and final homing phases. An intensified low-light level TV is used in conjunction with sonar during the precision guidance phase near the target mine. Vehicle power is provided to the two 15-horsepower hydraulic motors through a neutrally buoyant, constant tension 1,067-meter-long umbilical cable, which also carries signal and control links between the vessel and the MNV. The motors power two vertical and two horizontal hydraulic thrusters to give the vehicle a speed of up to six knots. The importance of a state-of-the-art mine countermeasures system was illustrated in the Persian Gulf during the eight years of the Iran-Iraq War, and during Operations Desert Shield and Desert Storm in 1990 and 1991. Navy MCM ships USS Avenger (MCM 1) and USSS Guardian (MCM 5) successfully conducted many MCM operations using MNVs to disable enemy mines. In the mid-1990s, the MNV was redesignated AN/SLQ-48 MNS (mine neutralization system). To date, the Navy has received a total of 28 mine neutralization systems including 57 vehicles, and AN/SLQ-48 MNVs are installed on all Navy Avenger- and Osprey-class MCM and MHC ships. The Navy is currently beginning to plan an improved mine neutralizer, the Expendable Mine Neutralization System (EMNS), that will replace the AN/SLQ-48.